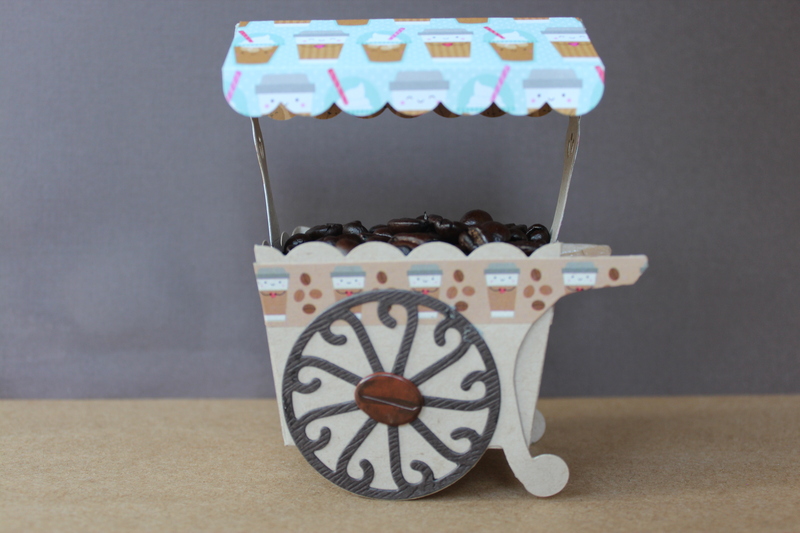 I thought I was finished making cards for this blog hop, but wouldn’t you know………..another idea popped into my head and just wouldn’t leave. Mercifully, the card came together much as it looked in my head with no real hitches. I started thinking about a coffee card.. card (?) for three reasons. First of all I am going on a cruise and was in the process of pre-ordering a coffee card so I would not have to drink the swill that they offer in most ship buffets. 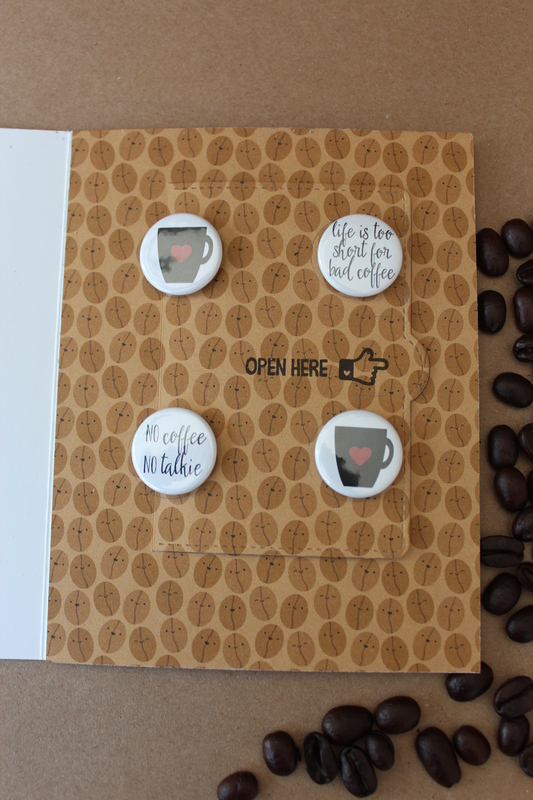 Secondly I was thinking about turning several of the coffee cards I have made into gift card holders just to use them up sometime in my lifetime. And finally, I had just gotten the Flip Up dies from Lawn Fawn’s latest release and wanted to take them for a test drive. Supplies: Memory Box Window Quad die, Woodgrain cardstock Paper and More, Doodlebug patterned paper, Feed Your Craft Flair buttons, Lawn Fawn Lift the Flap die, Lawn Fawn Push here stamp set, Impression Obsession Adirondack Chair and Flipflops. Worldwin cardstock, Mystery washi tape, Simon Says stamp card base and Scor tape. Like many others, I am guilty of buying copious amounts of washi tape that never gets used other than to hold down my dies as they go through my Bigshot. It wouldn’t be so bad if I would immediately recognize that this is the ultimate fate of my washi tape and use it for this purpose immediately. Oh no, not me. I wait until it is half dried up, sticks to inself, and comes off the roll in ripped little strips and only then do I decide to use it for this purpose. Now that is the new definition of insanity my friends. So why am I telling you this? It is because the washi tape I used on today’s card is the exception to the rule. I not only love this washi tape, but also have used it on real cards several times. I actually hoard it, if the truth be known and would never use it for the lowly job of holding down my dies. 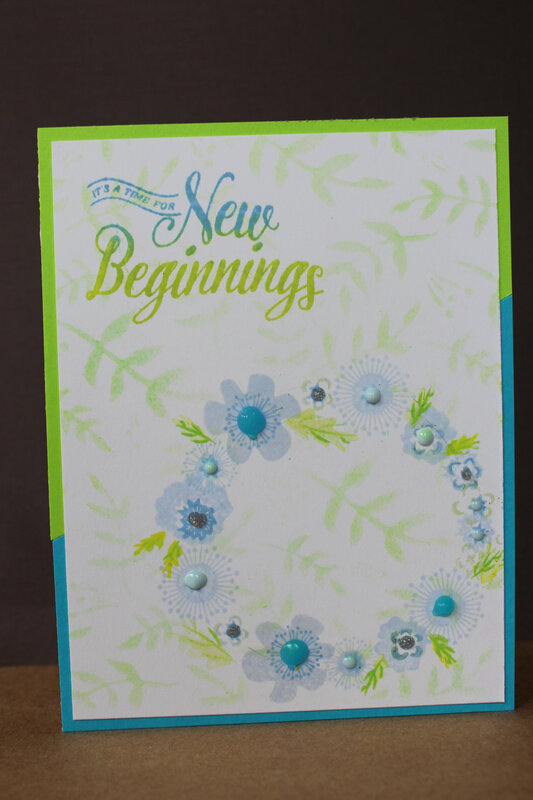 This card is simple and came together in minutes. 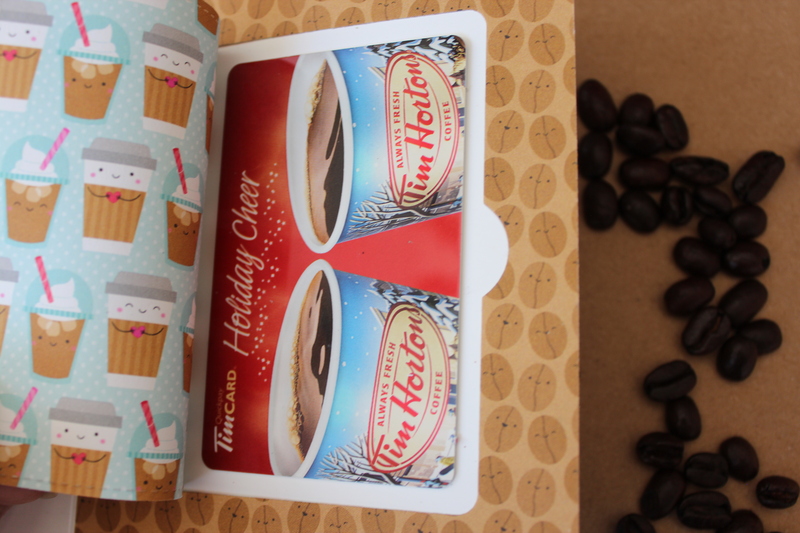 It uses a sticker in the Reminisce collection kit Coffee and Tea that describes me to a “tea” (or coffee rather). 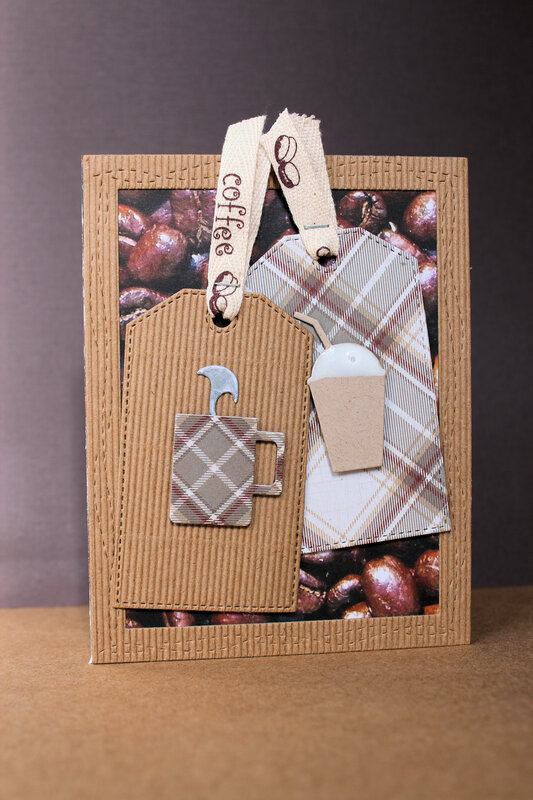 Supplies: Reminisce Coffee and Tea Collction kit, Alideco washi tape, Sizzix embossing folder, Avery Elle Wonky Stitches die set, Simon Says Stamp card base and Scor tape. Today’s card is a shout out to Stamplorations. 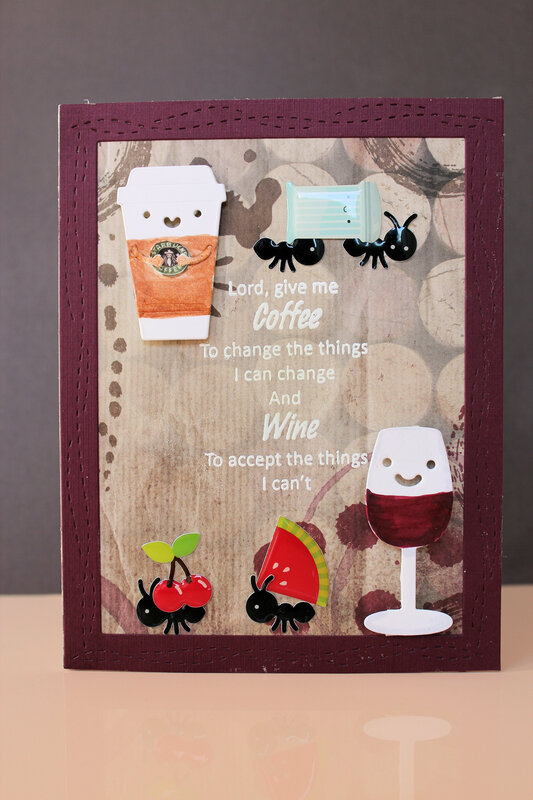 In the last Coffee Lovers Blog Hop I won all the dies used in this card except for the Wonky Stitched frame which is from Reverse Confetti. So once again, THANK YOU THANK YOU THANK YOU! 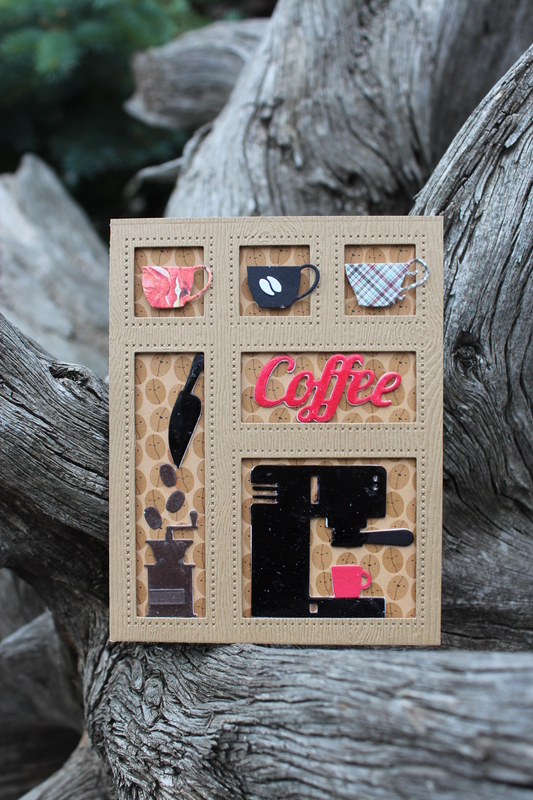 Supplies: Dies Cutplorations, Reverse Confetti All Framed Up die, Reminisce Coffee and Tea patterned paper, Authentique patterned paper, Stampin Up corrugated cardstock, Scotch foam tape, Scrapbook Adhesives foam squares, Simon Says Stamp card base and Scor tape. Interestingly, what I forgot was that the larger blue Nuvo drops are “glow in the dark”, which is a far cry from the soft ethereal look I was going for. I only remembered this when I took the card into my dark hallway to photograph the card. If you are looking for a product that “glows in the dark”, I can attest to the fact that these Nuvo drops do! Supplies: Papertrey ink Color Pop Florals stamp set, Papertrey Ink Make it Market Garden Gate stamps and stencil, Nuvo drops, Hero Arts Ombre dye inks, Recollections cardstock, Simon Says Stamp card base and Scor tape. This is my second post of the day. 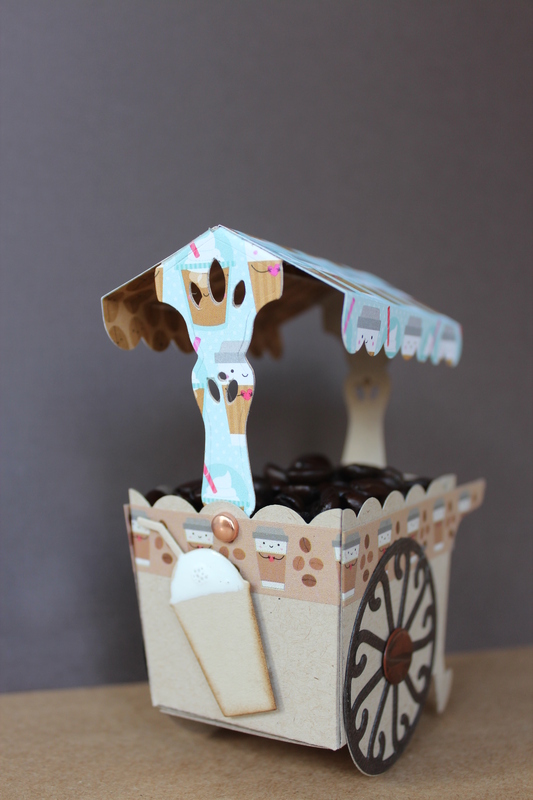 I don’t usually do that but The Coffee Lovers Blog Hop and the one day only Papertrey Ink Monthly Blog Hop are both on today. Because they are two of my favorite challenges, I had to do an entry for each one. I had a card in mind the instant I saw the inspiration photo. 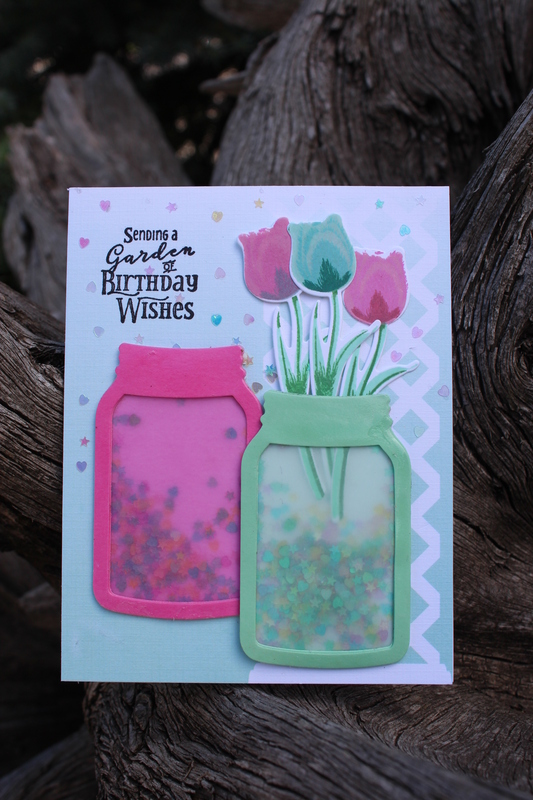 Somehow the days slipped away until I realized today is the blog hop day and I had not done my card. Sometimes necessity really is the “mother of invention” because I wanted to do a shaker card but was afraid I wouldn’t get it done before our dinner party tonight. As a result I made a modified shaker using tiny flat confetti that I had in my stash. It came together quite quickly and I love the result. 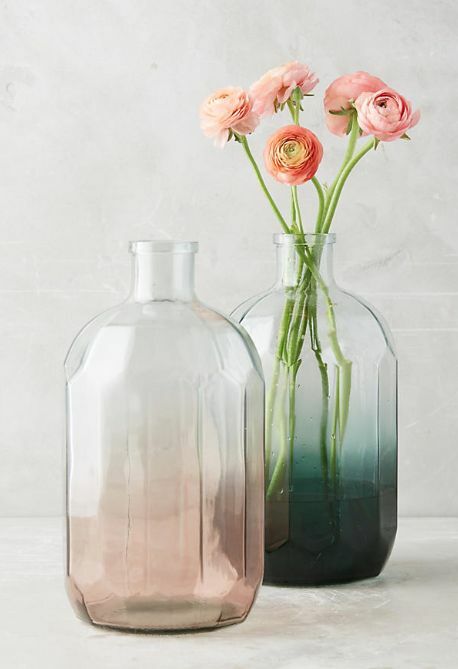 I like the vellum on the jars as a change up from acetate, but was sad that it muted the very pretty confetti pieces. In the end, I had enough time to glue a smattering of the tiny confetti on to the background and I think it finished the card off perfectly. Supplies: Papertrey Ink Friendship Shaker Die, Papertrey Ink Tulip Time stamp and dies, Papertrey Ink Garden Gate Stamp and patterned paper, Martha Stewart Confetti, Pico Embellisher Shimmer, Recollections Vellum, Simon Says Stamp card base, Hero Arts dye ink and Scor tape. Some cards take longer than others to come together. 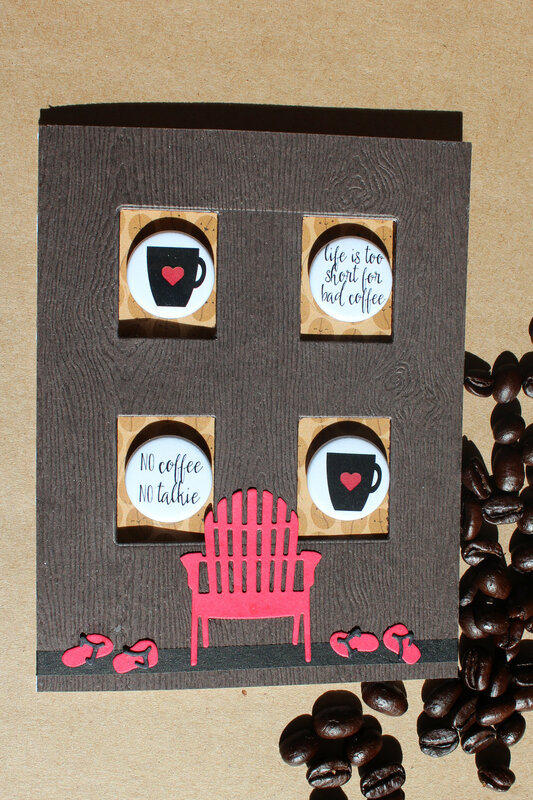 Today’s card for the Coffee Lovers Bloghop took forever and used up a lot of supplies. I almost abandoned the project about three times, but I reminded myself that if I don’t like it, it just means that I am not finished with it yet. And what do you know, at long last I ended up with a “keeper’. 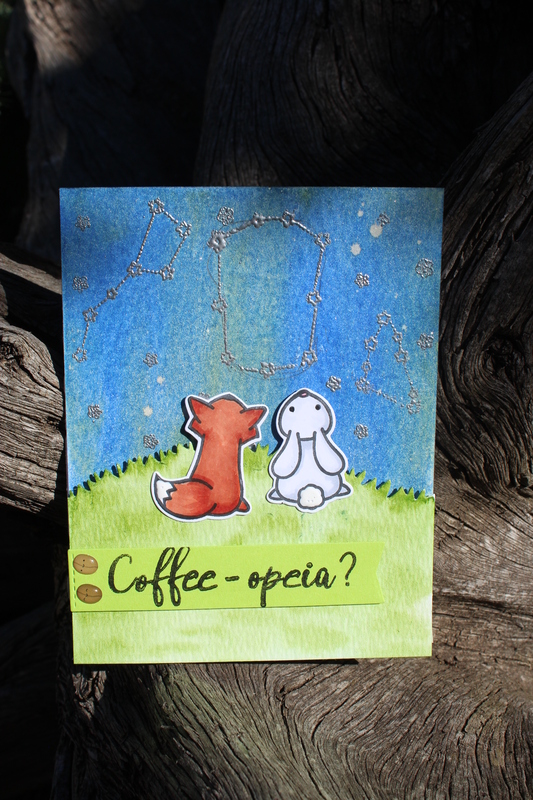 It would have been much easier and faster if I had given in to the idea of cutting up my stamps, so that I could fashion the constellation that I wanted, but Jimini Cricket the stamp set was brand new and I just couldn’t do it. Much grumbling and masking later, I finally ended up with the constellations I wanted and a watercoloured sky that I liked. Today’s card came from an experiment that just worked out. I had recently bought Deco Foil transfer gel based on a video from Jennifer McGuire. She demonstrated a dimensional foiling technique that looked interesting and I wanted to try it out. I admit that I was skeptical, as I had never been happy with any foiling technique except toner ink with a laminator. 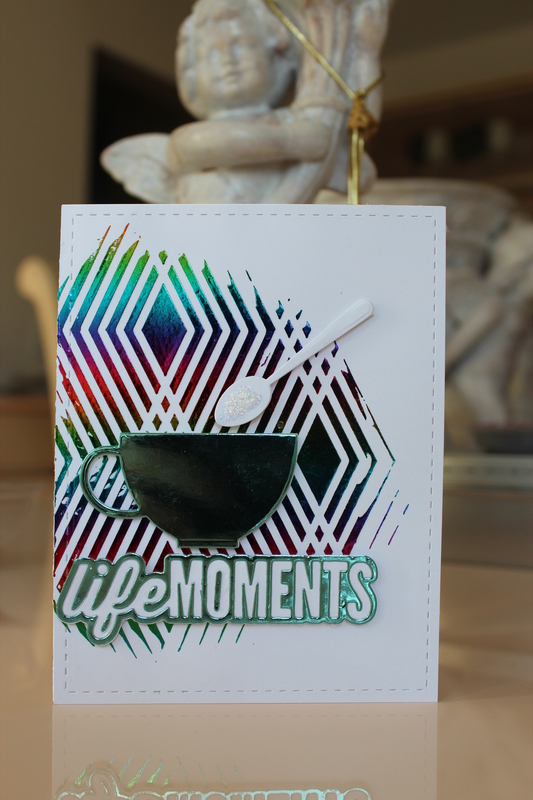 I was very happy with the resulting dimensional background and I wanted to turn it into a card. 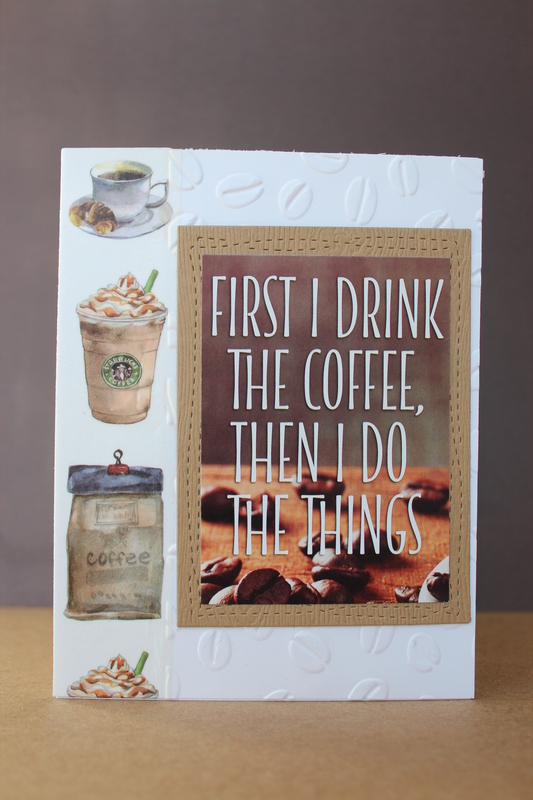 It ended up being a coffee card as my My Favorite Things Dienamics coffee die set happened to be sitting on my desk. 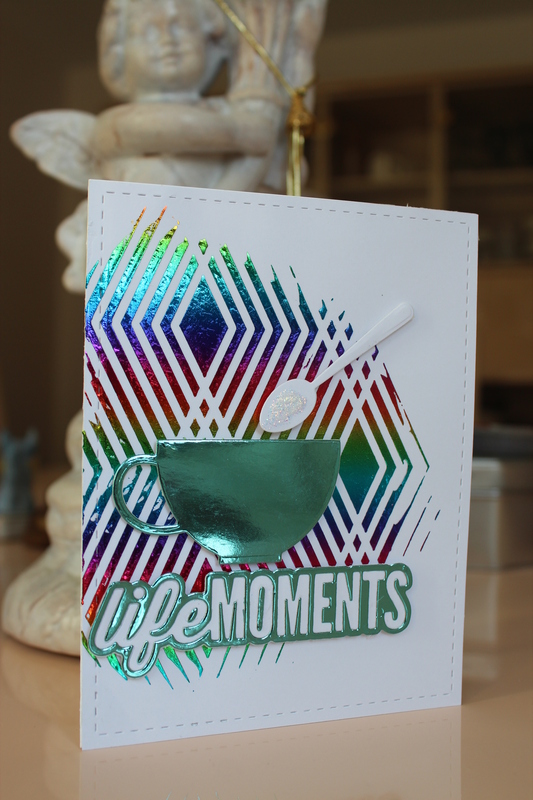 Supplies: Dienamics Tea Party die set, Hero Arts Diamond stencil, Decofoil Transfer Gel, Rainbow Decofoil, DCWV foiled cardstock, WeRMemory Keepers Words dies, Lil Inker Stitched Rectangle die, Copic X-pressit cardstock, Simon Says Stamp cardbase and Scor tape.